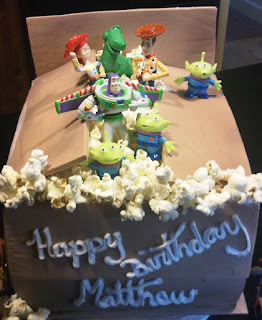 Sweet Sentiment: Cake, cake and more cake! Cake, cake and more cake! 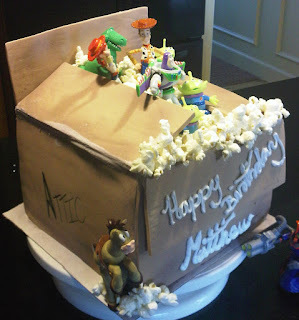 The entire box is made from cake and then covered in fondant. The packing material is air popped popcorn! ha ha I used an airbrush to distress the box so that it looked beaten up and old, I hope that translates in the pictures. 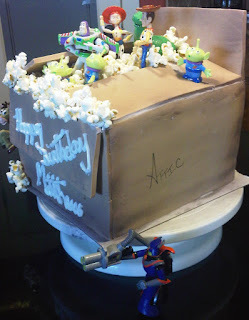 OK, well it's off to watch the SF Giants win, I'll be back for Fat Tuesday and keep checking back for more cakes soon! WOWZA! You are quite the creative genius! I can't wait to see more cakes and follow up on your diet and exercise! You are very inspirational...just wish my toes weren't hurting to much so I can run again!